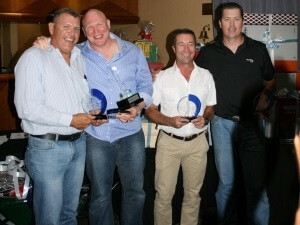 Value-added distributor, Networks Unlimited has raised more than R160 000 at its second annual corporate golf day event. The funds are in support of 'Literacy for Life', a non-profit organisation that provides educational writing and reading aid to disadvantaged schools. Through products such as WriteRight, a range of brightly coloured, quality wooden educational products that focus on developing handwriting skills as well as improving literacy and numeracy, Literacy for Life helps children within the Foundation Phase at cash strapped schools to learn to read and to write. The NPO relies on sponsorship from corporate companies to be able to provide these products and the relevant training. These educational products have a positive impact in improving the learning of many pupils from disadvantaged backgrounds. The Progress in Reading and Literacy Study (PIRLS 2006) tested Grade 4 and 5 children in 45 countries in reading literacy. Out of the 45 participating countries, South Africa came last and it reflected that only 13% of Grade 4 and 22% of Grade 5 learners reached the Low International Benchmark of 400. This is in stark contrast to the majority of other participating countries. 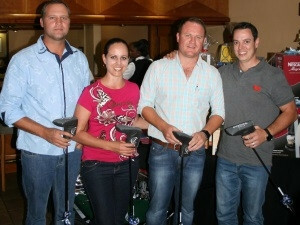 2nd place, the SimpliVity fourball: Left to right - Morne Van Rensburg, Talita Van De Heever, Trevor Hankey, Martin Vorster. Anton Jacobsz, managing director at Networks Unlimited says, "These figures highlight the importance of giving our learners additional support, providing them the confidence and motivation needed to learn to write. The purpose of Networks Unlimited's recent golf day was to have a corporate challenge that was meaningful and makes a significant difference. 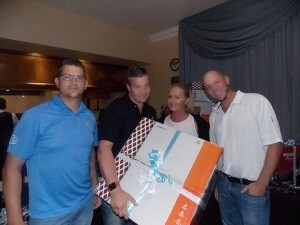 At the end of the golf challenge, while the winning team may have received a floating trophy, the real winners are the children that will be assisted through the funds we raised with the partners and vendors that helped to support this event." he explains. "The day was a huge success. There is no greater charity than the gift of education and contribution towards a child's development, as this will ultimately have a positive impact in the country's progress and growth," comments Jacobsz. "We are extremely thankful for the contribution made by our partners namely, Arbor, Aruba, Big Save, Datacentrix, EOH, F5 Networks, Fortinet, Harvey World Travel, Holiday Inn, Matador, Mellanox Technologies, Mochana, Nexia, Pick n Pay Steenberg, ProLabs, Riverbed Technology, RSA, SimpliVity, Three6Five, Tintri, and a very special thanks to Unlimited Events Group for the wonderful d'ecor at the awards dinner as well as for leading the auction." Networks Unlimited is a value-added distributor, offering the best and latest solutions within the converged technology, data centre, networking, and security landscapes. The company distributes best-of-breed products, including Arbor Networks, Aruba Networks, Fortinet, F5, Mellanox, ProLabs, Riverbed, RSA, SimpliVity and Tintri. The product portfolio provides solutions from the edge to the data centre, and addresses key areas such as cloud networking and integration, WAN optimisation, application performance management, application delivery networking, WiFi-, mobile- and networking security, load balancing, data centre in-a-box, and storage for virtual machines.